Plesiosaurs were predatory reptiles of the Cretaceous Western Interior Seaway. These ambush predators had torpedo-shaped bodies that were streamlined for speed and power with limbs modified as paddles, and jaws furnished with strong, piercing teeth. With large heads and jaws, short necks, and compact bodies built for overpowering prey, these were terrors of the Cretaceous Sea. Some recent MNA excavations in the Tropic Shale, located in southeastern Utah near Big Water have established five species of short-necked plesiosaurs along what was once the southwestern shores of the ancient Seaway, three of them new to science. 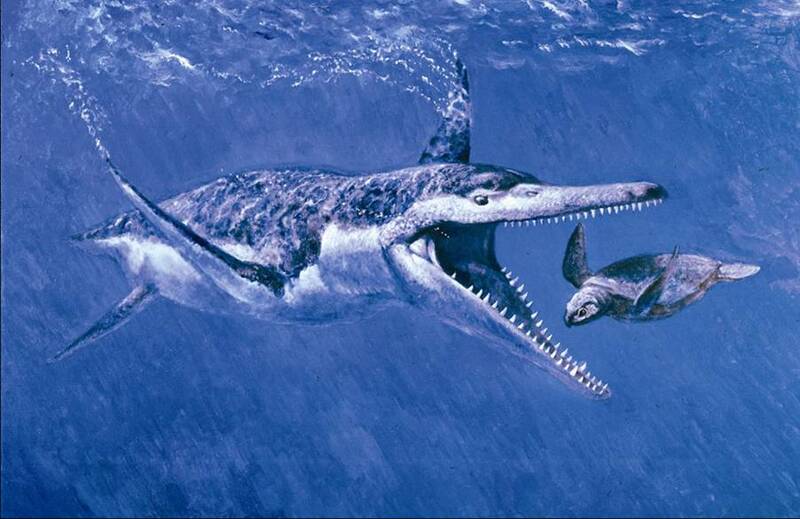 The painting above is artist Dan Varner's interpretation of a sea turtle and one of the plesiosaurs in this fauna. Short-neck plesiosaurs are thought to have been ambush predators with torpedo-shaped bodies streamlined for speed and power, with paddles for limbs and strong, piercing teeth. Long-neck plesiosaurs, on the other hand, were not as fast or as powerful as their short-neck relatives. In the animation here, a long-neck plesiosaur’s swimming habits are demonstrated by a robotic sculpture created by artists Brian and Eric Gold.